Searching for the best services for Pest control Melbourne? Hire the exceptional pest control services of Be Pest Free in Melbourne. Over 20 years of experience and 100% Guaranteed pest control. Call us on 1800 339 712 to book same day pest controller!!! Our pest control methods are non-invasive, eco-friendly and generally do not require the evacuation of your home. We only use local and approved Australian pest-killing products. All pest control products that we use are pet and child-friendly. The use of environmentally-friendly chemicals for pest control and removal from your home and business sets us apart from the rest. 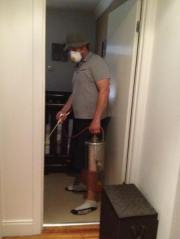 By hiring us for pest fumigation in Melbourne you can stay at the peace of mind that your home is in safe hands. We provide same day pest control services in Melbourne. A Metropolitan like Melbourne with its dense population, eateries, and places to breed etc has, therefore, all the means by which a pest infestation can become a common problem for anyone at any time of the year. And so when pest control in Melbourne becomes a problem for you; we are here to provide a permanent solution for rodent control, cockroach control, rat and bat control or any other pest problems that are going out of your own control. Why Pest Control Melbourne is Important? Cockroaches are a threat to your health as well as your home. They not only are responsible for causing health hazards but also mess around the home. Their existence in the home can affect your presence. They intrude into your place through crack and crevices and multiply in population rapidly. Hence, if you want to control their infestation in the house, make sure you seal all their entry points. However, if the infestation has already reached to a high extent, it is advisable to take the professional help. And Be Pest Free is the one-stop destination when it comes to pest control Melbourne. No matter how big the infestation is, our professional pest controllers can handle it with their experience and skills. Flea Pest Control is another one of the best pest control services we offer in Melbourne. When there is a heavy infestation of fleas at your place, it is important you get it treated as soon as possible. The flea infestation in the home can harm your pets as well as family members. And when the infestation has reached to a heavy extent, no DIY methods seem to work. Thus, you need to hire professional pest controllers to your place for the flea treatment in the home. Also, if you give little attention to your surroundings you can avoid fleas infestation in the home. In case, if you are seeking any professionals help, Be Pest Free can be the best bet for you. Do you know what pre-purchase pest treatment is? Well, it is something that can help you save money and many troubles. Pre-purchase pest inspection helps determine the buyers whether to invest in a property or not. Pre-purchase pest inspection is important as it helps investigate whether a property is under pest attack or not. Buying property, whether residential or commercial is one of the biggest investments in one’s life, and thus, there is nothing wrong in being doubly sure. The professionals of our team can help you with the property inspection and can treat the issue if suggested by the clients. You can get free but the best quotes in the city of Melbourne by just dialling at 1800 339 712. Our 24 hours Pest Control Melbourne customer service will make sure you don’t have to spend another minute worrying over your pest problems.